Jason Levinthal interviews Blister’s editor in chief, Jonathan Ellsworth, about how and why we do what we do at Blister. This video sums it up. Love the website, appreciate the in-depth reviews, and I especially enjoy knowing it’s unbiased. I bought last year’s Cochise based largely off your reviews, and it skied just as you wrote…even though I’m not as aggressive as any of the reviewers. Keep up the great work! Thanks, Skip. Glad we could help you find the right ski. Jonathan when I found your site a few years back it has always been my go to site for buying gear. I sift threw reviews as you mentioned on everything i buy and i cant seem to get a handle on how it is except off your teams reviews. I turned a few shops on to your site and they also find your info useful and will refer to a blister review of the skis to customers. I wish you guys would have a short video of the skis you test with the reviews. The pics of the mentioned terrain are great and they do tell a thousand words buy looking at the terrain and form of the skier… I find a clip of some turns tells me more though. I purchased the Wailer hybird 99 from your tests and the information accurate and the detunning suggestion right on the money. The Bonified is the ski i wanted and LOVE!! but needed a turned up tail for switch. The wailer seemed to fit the bill over the Bonifed in this respect at a small compromise in all terrain capability but with enough uniqueness to make it worthy of the purchase. The Regulator would be the ski if it had at least one layer of ti. A Bonified with a turned up tail to ride switch or 2015 Cochise for that matter would be the best ski ever made for resort skiing period and no other ski could touch it for Intermediate to expert riders that take off and land switch once and a while. The wailer 99 Hybird is close but again needs that bit of ti like the 105 construction and lighter to make it better. Oh and they need to dial back that harsh tune on a ski like that. OK for a race stock SL ski but doesn’t suit the Wailer or help its skiablity for 200+ lbers in any way. A lighter weight skiier who wouldn’t trench out as deep as a heavier same ability skier might find tune much better suited toward there weight. Anyway Im starting to ramble on, :] I just wanted to say awesome and keep up the great job. Your reviews have made me a better informed gear buyer for my whole family. After 50+ years of skiing, and almost as many years of reading those other reviews, I can say hand on heart, that this is the most comprehensive, honest and reliable review publication I’ve ever come across. Thank you for the work you all do here. If you keep writing, I’m going to keep on reading and recommending you to all my ski buddies. Thank you, Hart. And we are most definitely going to keep writing. Jonathan, it’s refreshing to see an un biased review. It’s true there is something out there for everyone and retailers seem to have just what we need, but really products differ as do people. A good review should point out a products good points and not so good points, uses and warnings. Your reviews do just that. Big props! I too don’t like sifting through reviews from manufacturers painted on someone’s website, it’s just plain lazy and a waste of my time. Thanks again in this regard. There is, in fact, a product out there suitable for everyone and your reviews will help that person find it. I don’t know how you get paid for what you do beyond advertising on your site, but you deserve to be paid well for the service you provide. 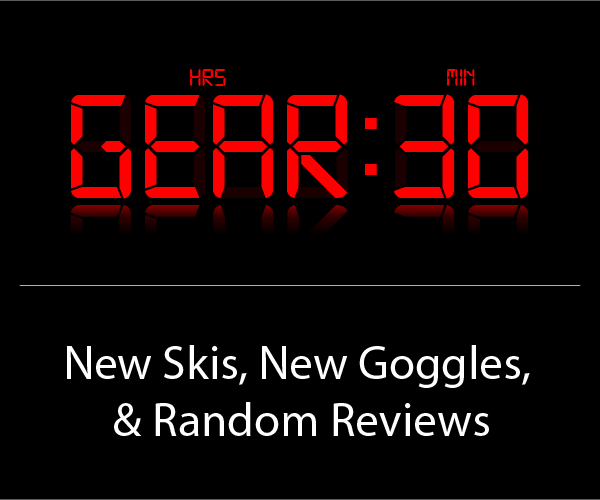 Hands down the most comprehensive ski reviews with substance that you can find anywhere. I turn people on to your site as often as possible. I continually quote information from your reviews in my job selling skis boots and bindings. Test as many skies as I can from my shop and sync it up with your test results to inform my customers about getting the best possible ski equipment suited to their ability and needs. Can’t thank you enough for the service you’ve provided. Makes my job that much easier. You talk with interesting well informed people…. I ski/snowboard/climb and mtn bike so they are great for me!! !